ATTENTION TO ALL ASPIRING AND EXPERIENCED DANCERS!! 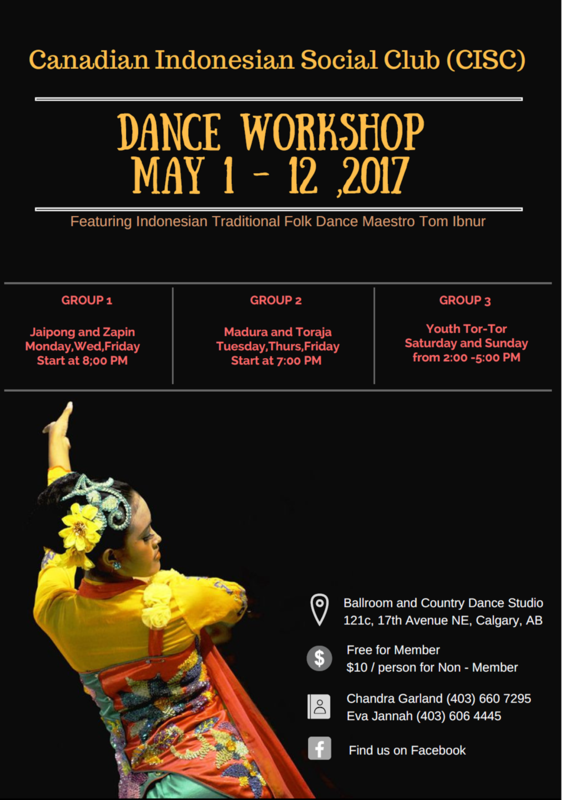 An extremely rare opportunity to learn traditional Indonesian dances from the master itself, Mr. Tom Ibnur, has just arrived. This will be a very intensive, yet super fun 12 days dance workshop, starting from May 1-12, 2017. Want to know the best thing about this workshop? It's open for everybody, and it's FREE for CISC member! All we ask of you is your commitment to show up ON TIME to the practice according to the schedule (see poster) and your willingness to perform the dance in our Cultural Night 2017, May 13, 2017. PLUS, you probably get a chance to travel to perform the dance out of Calgary, too. How cool is that?! Space is very limited. Register now! See poster for workshop and registration detail.